Adarshi is a 10 year old girl. Adarshi is one of 2 children. The family relies on their father's ability to sell vegetables at the market and school fees are out of reach. 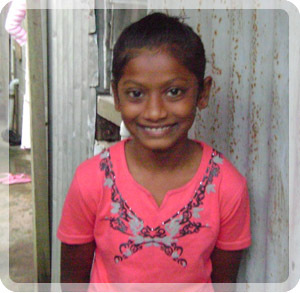 Adarshi enjoys attending school and her favourite subject is all subjects. Adarshi travels to school each day by bus. When she grows up, Adarshi wants to be a teacher. A lovely little girl who deserves support with her schooling. Adarshi is currently looking for a sponsor to continue schooling. Adarshi now receives the education every child deserves.